When it comes to engagement rings, most people only think of the bride-to-be. But let’s not forget about the groom-to-be. Men’s engagement rings are just as important as women’s engagement rings. It’s really not fair to overlook the groom. And who says a woman can’t propose and present her beloved with a men’s engagement ring? Some men may not care about having their own engagement ring but, nonetheless, men’s engagement rings are increasing in popularity. Men’s engagement rings usually aren’t as fancy as those for women. They don’t have diamonds held up with prong settings, and they usually don’t contain large diamonds. Subtle is the key when it comes to men’s engagement rings. 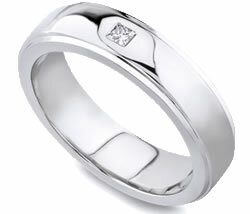 Most men’s engagement rings are gold or platinum bands containing slight embellishments. Our brushed metal platinum band with a metal rope edge is a fine example of a plain band that is also beautiful and stunning. However, some men prefer elaborate engagement rings. For instance, some of our men’s engagement rings are two-tone rings. They are made using more than one type of metal. If you browse our collection, you will see men’s engagement rings made from both yellow and white gold, or yellow gold and platinum. They may also contain tints and elaborate engravings. Some men also prefer men's diamond bands. We are especially proud of our men’s band with round and princess diamonds. Take a look and you’ll see what we mean. Men’s engagement rings don’t normally have center diamonds surrounded by accent stones. You will notice that many men’s engagement rings, if they contain diamonds, have the diamonds either set into the band, or set within the center of the ring itself. Rings made this way are less prone to damage and are more practical for strenuous activity. Men’s engagement rings are less focused on diamonds than female engagement rings. As a result, colored stones are popular with men’s engagement rings. Diamonds and colored stones create a visually appealing combination. Some men’s engagement rings come in wedding sets so that both rings can be worn together. If the groom prefers one ring, then both rings can be joined together. Also, the engagement ring can simply be moved to the right hand following the wedding ceremony. Men’s engagement rings cost about the same as women’s engagement rings. The bulk of the price for men’s engagement rings comes from the weight of the metal. Usually, the weight of the metal in men’s engagement rings is much greater than in a woman’s ring. However, plain bands are less expensive than more intricate bands. If you’re planning to propose to your boyfriend, try to find out ahead of time if he’d like a men’s engagement ring. Some men like them and some don’t. But don’t think for a minute that men’s engagement rings are boring or feminine. After a few minutes on our site, you’ll see that men’s engagement rings are distinctive and beautiful.